I used to soften the noodles in hot water and then toss them in the pan with seasonings. The problem was I always ended up with lumpy noodles before I could mix the seasonings evenly with the rice stick noodles. However, this is all changed when my friend taught me how to cook everything in one pan using the absorption method. 1 Add about 4 tbsp of cooking oil and sliced shallots in a large pan and saute over low-medium heat until golden brown and crispy. (be careful not to burn them) Transfer the crispy shallots and excess oil to a flat bowl and set aside. 2 With some of the shallot oil remaining in the pan, saute garlic over low heat until aromatic. 3 Add soy sauce and allow it to sizzle for about 5 seconds in the pan. 4 Then add 4 cups of boiling water, salt, sesame oil, white pepper, and chili sauce. Stir to combine and wait until the "broth" starts to boil. 5 When the broth is bubbling, add the dried rice stick noodles. 6 Using tongs, toss the noodles around in the broth until all are evenly absorbed. 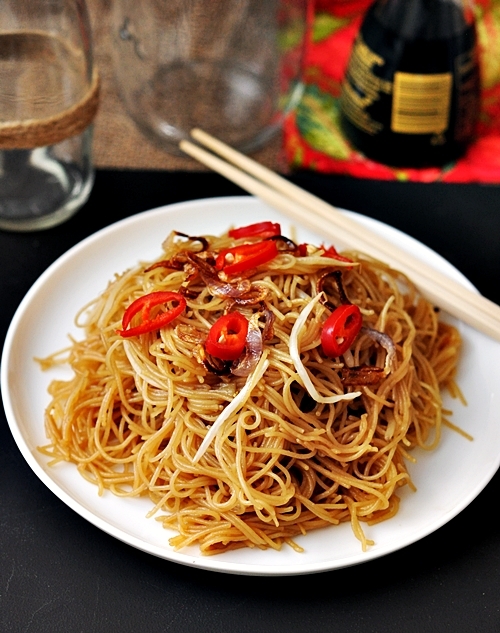 7 When the noodles are almost cooked, add bean sprouts and toss evenly with the noodles. 8 Sprinkle with crispy shallots before serving.